Bhaskargad FortHeight : 2500 ft.
Bhaskargad or Basgad is a part of Trimbak range, near to the famous �Trimbakeshwar�, one of the 12 �Jyotirlingas� in India. This is 43 km east of Nashik, and was built to guard the ancient Gonda pass which was a trade route from the west coast towards Nashik. History of Bhaskargad is not available. However, the rock cut steps along the mountain face and the stone cut covered cisterns are characteristics of forts built during the rule Satvaahan dynasty and indicate that the fort is ancient. During 1271 to 1308 this fort was under the control of Yadavas of Devgiri. When Devgiri was taken over by Bahamanis, this fort went under their control. When Shahaji Maharaj revolted against Nizamshahi in 1629, the fort went under his control. In 1633, the Moghuls gained control over Bhaskargad. In 1670, Moropant Pingle won this fort for Shivaji Maharaj and the Moghuls regained it in 1688. In 1730, the fishermen rebelled with Mughals and captured the fort. Later it was with Peshwas till the British captured it in 1818. The forts in this region are built on characteristically shaped mountains. The mountain of Bhaskargad comprises mainly of basalt rock. The steps are cut through the mountain rock and take us through the stone walls towards the main entrance, which is buried under soil now. We have to enter by crawling. Once we reach the cap of the mountain, we can roam about the edge of the fort. We can find some remnants of houses and cisterns on the fort top. The base village of this fort is Nirgudpada, which is 20 km away from Trimbakeshwar. From Nirgudpada, the forts Harihar and Bhaskargad are visible, and Bhaskargad is to the left side of the village. We need to cross a rivulet to reach the trail to the fort, which takes us to the steps after a hike for an hour and half. Nirgudpada is about 50 km to the east of Nashik on SH27, on the road to Trimbakeshwar. If we are traveling at odd hours on this route, better to have a private vehicle as buses might not be frequent. Also, this is a very lonely route for night traveling. Two day trek can be planned to visit Harihar, Basgad, and Trimbakeshwar. 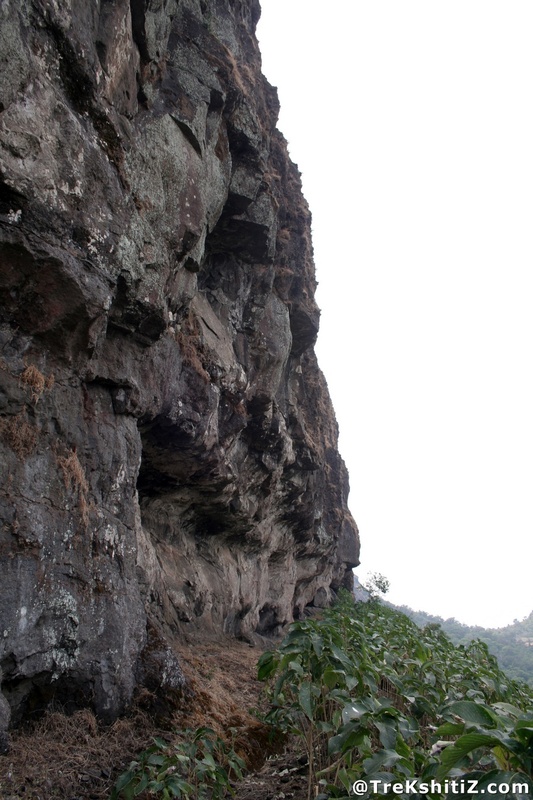 Anjaneri and Brahmagiri forts can be covered if a range trek is planned.